Not your typical garden feature this week. 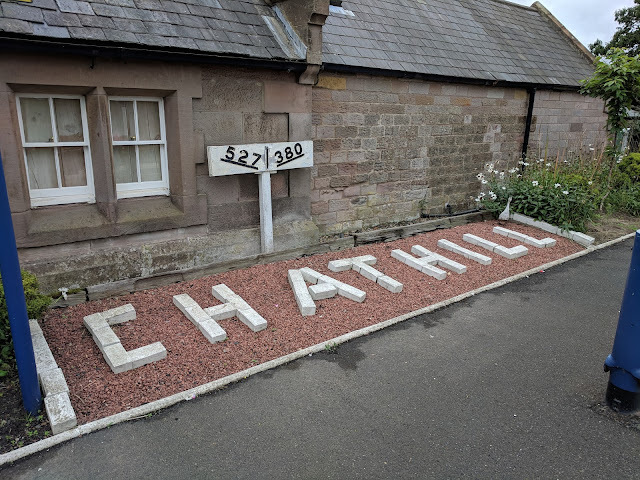 On our travels throughout Northumberland we came across Chathill railway station. I have to admit I was first taken by the old but very large Post Office building and house opposite the station. The Post Office no longer operates from this site but the station and its train services still continue – just. There are only two services each way a day which stop at Chathill. An early morning and evening service takes passengers to Newcastle and back. 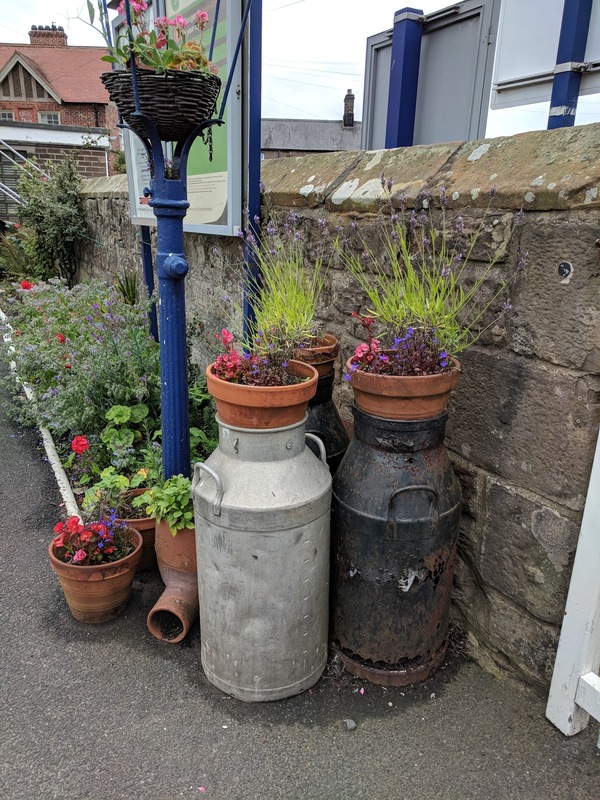 During the day this sleepy village is jolted by the frequent high-speed service that goes from Kings Cross to Edinburgh. 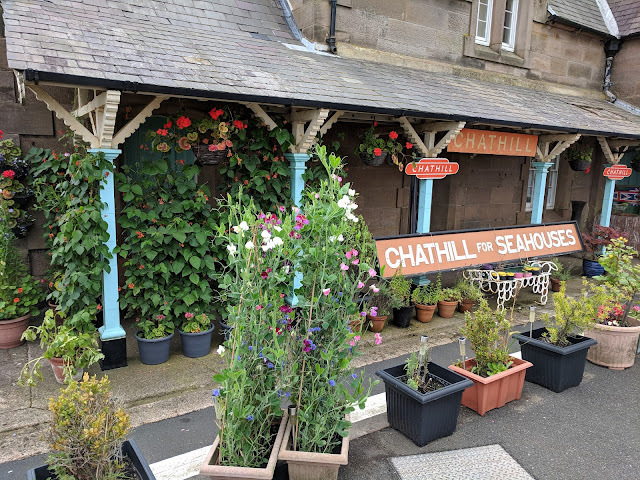 If you want to travel north from Chathill you need to go south first to Alnmouth to catch a connecting train. The signal box and station building are Grade II listed and are no longer in use. The station building is now a private house. These are not the stand out features when you arrive on the platform. 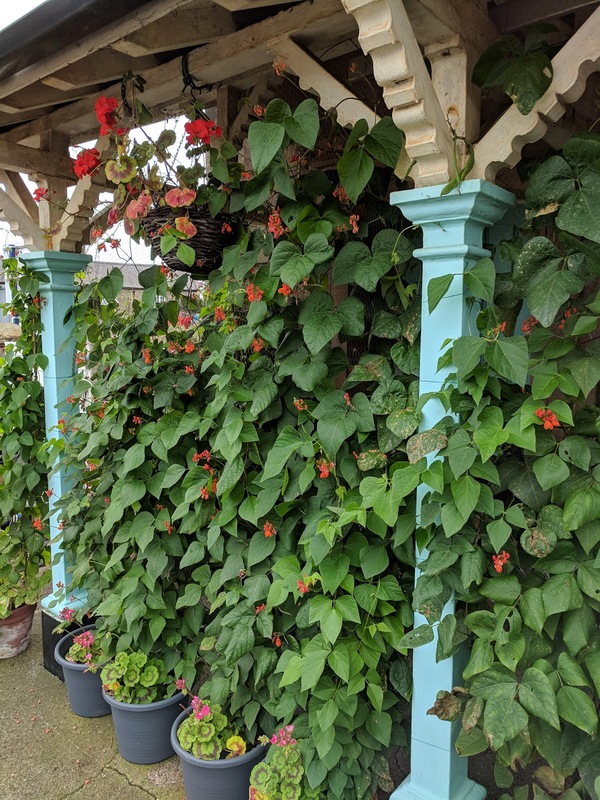 Pots of flowers and plants fill the platform. Along with the period signage you could be mistaken for thinking this is now a preserved or heritage line. 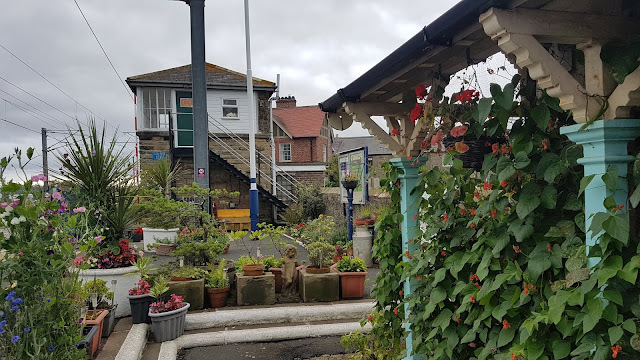 At one point many small stations with a guard who lived on site had a small garden with a vegetable patch. The steam engines running on tonnes of coal provided plenty of ashes for use on the veg patches and roses. These days the use of coal ashes in gardens is not encouraged. The milk urns are a remnant of the days when the railway played an important part of getting fresh milk from the countryside to the towns and cities. The station opened in 1847 as part of the York, Newcastle and Berwick Railway. The station building was designed in a neo-Tudor style by Benjamin Green. It was described by the architectural historian Sir Nikolaus Pevsner as “most attractive and satisfyingly complete”. 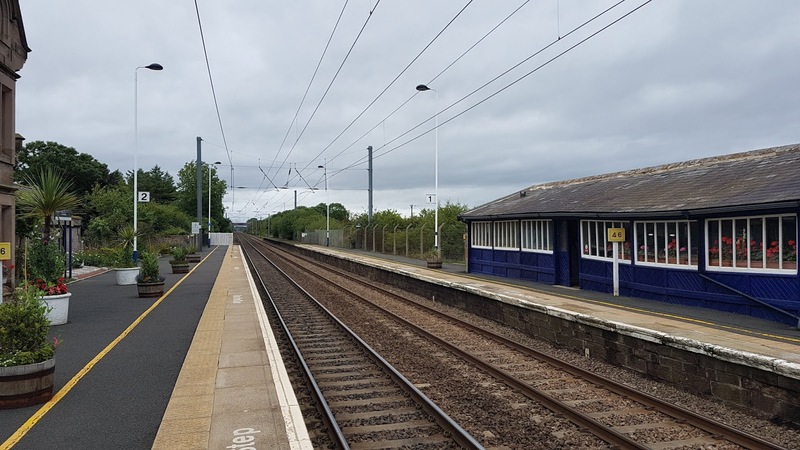 At one point it connected to the branch line that went to the fishing port and tourist village of Seahouses but this line closed in 1951. These days visitors to Seahouses are probably better advised to travel to Berwick and then catch the bus to Seahouses. It's still worth a trip to Chathill for the flowers though.